Lucky for you if Spring has sprung in your neck of the woods. In Minneapolis, the snow is still coming down in some accumulation every other day, the wind that blows is still icy rather than cool, and the back parking lot of our apartment building has a covering of ice so thick, you could preserve a dinosaur in it. Please, goddess of all things blogging, let it be our last winter here. While Minneapolis is a great city and saw me through my grad program with no shortage of laughter or love, the winters are killer and in a way that no New England winter ever was. I will take a Nor’easter over an Alberta Clipper any day. Oh, how I rue the day I was forced to finally learn the meaning of that phrase! If I thought it’d ever see the light of day when posted on Pinterest, I might even consider naming this recipe Alberta Clipper soup, as it saw us through the tail end of one a week or so ago. With temperatures hovering around -15°F, it was clearly soup weather, but what kind? I wanted something that felt a little exciting, that brought some heat even if just on the palate, something different than the creamy soups of early winter and the clear, chicken-broth based, lighter ones that welcomed in the new year. When I pulled Italian sausage from the freezer, I nearly ditched soup altogether and made sausage and peppers, but started thinking about roasted red peppers in the jar, how they make such a deep, creamy soup base if you treat them real nice. I remembered I had kale par-boiled and weatherproofed in the freezer just waiting for me to plunge it into something hot – you can certainly use fresh, though, and just plan on cooking it a bit longer until it is wilted. The rest of the soup came together easily: a heavy dose of red pepper flakes to warm the throat and nose, Worcestershire sauce for beefiness, and plump little cheese tortellini simply because they’re delicious. When the soup is nearly finished (before adding the sausage back in to simmer for a bit, before the tortellini join the party), I took some broth and the veggies that came with it to a separate bowl and gave it all a thorough pureeing with the immersion blender, though you could of course use a blender or food processor too. This resulted in about 2 cups of a thick (think chunky applesauce consistency) broth that when added back to the soup made the body of it all velvety. Our bowls were warm and ample. This soup goes perfectly with good conversation, a sip or two of dry red wine, and a fireplace. Or, if you’re us, a DVR cached showing of the yule log. On mute. In an 8-quart stock pot, add 1 Tablespoon of oil and cook chunks of sausage over medium high until they are cooked through. Remove from the pot and set aside. Assess the bottom of the pot and add another tablespoon of oil if needed in order to sautee onion over medium heat until translucent. Add garlic and cook an additional 2 minutes. Add red pepper flakes, dried basil, bay leaf, and salt & pepper to the onion mixture and allow to continue cooking for another minute or two being careful not to burn the garlic. Add the 8 cups of broth, the Worcestershire sauce, and put on a lid leaving it slightly ajar. Cook until the soup comes to a low boil. Add the kale and cook until wilted. Next, add the cooked sausage and cook an additional 5 minutes on medium-low. 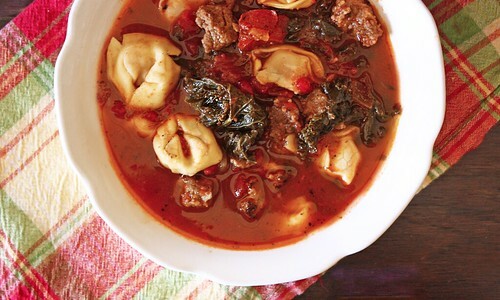 At this point, you can add the cooked tortellini to the soup and serve the whole pot as a meal or add the tortellini to individual bowls and ladle the hot soup on top. As per usual with soup, this is even better the next day! *Note: I choose to cook my tortellini separately and add it to individual bowls rather than cooking it in the soup or adding it after it’s been cooked and storing it combined because I find pasta loses any texture when kept in the broth in the fridge. If this doesn’t bother you or you prefer your pasta soft, feel free to add it earlier or cook it in the broth.